Soldier wounded at the Battle of Antietam on September 17, 1862. A head injury is any injury that results in trauma to the skull or brain. The terms traumatic brain injury and head injury are often used interchangeably in the medical literature. Because head injuries cover such a broad scope of injuries, there are many causes—including accidents, falls, physical assault, or traffic accidents—that can cause head injuries. The number of new cases is 1.7 million in the United States each year, with about 3% of these incidents leading to death. Adults have head injuries more frequently than any age group resulting from falls, motor vehicle crashes, colliding or being struck by an object, or assaults. Children, however, may experience head injuries from accidental falls or intentional causes (such as being struck or shaken) leading to hospitalization. Acquired brain injury (ABI) is a term used in appropriate circles to differentiate brain injuries occurring after birth from injury, from a genetic disorder, or from a congenital disorder. Unlike a broken bone where trauma to the body is obvious, head trauma can sometimes be conspicuous or inconspicuous. In the case of an open head injury, the skull is cracked and broken by an object that makes contact with the brain. This leads to bleeding. Other obvious symptoms can be neurological in nature. The person may become sleepy, behave abnormally, lose consciousness, vomit, develop a severe headache, have mismatched pupil sizes, and/or be unable to move certain parts of the body. While these symptoms happen immediately after a head injury occurs, many problems can develop later in life. Alzheimer’s disease, for example, is much more likely to develop in a person who has experienced a head injury. Brain damage, which is the destruction or degeneration of brain cells, is a common occurrence in those who experience a head injury. Neurotoxicity is another cause of brain damage that typically refers to selective, chemically induced neuron/brain damage. Head injuries include both injuries to the brain and those to other parts of the head, such as the scalp and skull. Head injuries can be closed or open. A closed (non-missile) head injury is where the dura mater remains intact. The skull can be fractured, but not necessarily. A penetrating head injury occurs when an object pierces the skull and breaches the dura mater. Brain injuries may be diffuse, occurring over a wide area, or focal, located in a small, specific area. A head injury may cause skull fracture, which may or may not be associated with injury to the brain. Some patients may have linear or depressed skull fractures.If intracranial hemorrhage occurs, a hematoma within the skull can put pressure on the brain. Types of intracranial hemorrhage include subdural, subarachnoid, extradural, and intraparenchymal hematoma. Craniotomy surgeries are used in these cases to lessen the pressure by draining off blood. Brain injury can occur at the site of impact, but can also be at the opposite side of the skull due to a contrecoup effect (the impact to the head can cause the brain to move within the skull, causing the brain to impact the interior of the skull opposite the head-impact). If the impact causes the head to move, the injury may be worsened, because the brain may ricochet inside the skull causing additional impacts, or the brain may stay relatively still (due to inertia) but be hit by the moving skull (both are contrecoup injuries). A concussion is a form of a mild traumatic brain injury (TBI). This injury is a result due to a blow to the head that could make the person’s physical, cognitive, and emotional behaviors irregular. Symptoms may include clumsiness, fatigue, confusion, nausea, blurry vision, headaches, and others. Mild concussions are associated with sequelae. Severity is measured using various concussion grading systems. A slightly greater injury is associated with both anterograde and retrograde amnesia (inability to remember events before or after the injury). The amount of time that the amnesia is present correlates with the severity of the injury. In all cases the patients develop postconcussion syndrome, which includes memory problems, dizziness, tiredness, sickness and depression. Cerebral concussion is the most common head injury seen in children. Types of intracranial hemorrhage are roughly grouped into intra-axial and extra-axial. The hemorrhage is considered a focal brain injury; that is, it occurs in a localized spot rather than causing diffuse damage over a wider area. Intra-axial hemorrhage is bleeding within the brain itself, or cerebral hemorrhage. This category includes intraparenchymal hemorrhage, or bleeding within the brain tissue, and intraventricular hemorrhage, bleeding within the brain's ventricles (particularly of premature infants). Intra-axial hemorrhages are more dangerous and harder to treat than extra-axial bleeds. Epidural hemorrhage (extradural hemorrhage) which occur between the dura mater (the outermost meninx) and the skull, is caused by trauma. It may result from laceration of an artery, most commonly the middle meningeal artery. This is a very dangerous type of injury because the bleed is from a high-pressure system and deadly increases in intracranial pressure can result rapidly. However, it is the least common type of meningeal bleeding and is seen in 1% to 3% cases of head injury . Head CT shows lenticular (convex) deformity. Subdural hemorrhage results from tearing of the bridging veins in the subdural space between the dura and arachnoid mater. Subarachnoid hemorrhage, which occur between the arachnoid and pia meningeal layers, like intraparenchymal hemorrhage, can result either from trauma or from ruptures of aneurysms or arteriovenous malformations. Blood is seen layering into the brain along sulci and fissures, or filling cisterns (most often the suprasellar cistern because of the presence of the vessels of the circle of Willis and their branchpoints within that space). The classic presentation of subarachnoid hemorrhage is the sudden onset of a severe headache (a thunderclap headache). This can be a very dangerous entity, and requires emergent neurosurgical evaluation, and sometimes urgent intervention. Cerebral contusion is bruising of the brain tissue. The majority of contusions occur in the frontal and temporal lobes. Complications may include cerebral edema and transtentorial herniation. The goal of treatment should be to treat the increased intracranial pressure. The prognosis is guarded. Diffuse axonal injury, or DAI, usually occurs as the result of an acceleration or deceleration motion, not necessarily an impact. Axons are stretched and damaged when parts of the brain of differing density slide over one another. Prognoses vary widely depending on the extent of damage. Three categories used for classifying the severity of brain injuries are mild, moderate or severe. Symptoms of a mild brain injury include headaches, confusions, ringing ears, fatigue, changes in sleep patterns, mood or behavior. Other symptoms include trouble with memory, concentration, attention or thinking. Mental fatigue is a common debilitating experience and may not be linked by the patient to the original (minor) incident. Narcolepsy and sleep disorders are common misdiagnoses. Cognitive symptoms include confusion, aggressive, abnormal behavior, slurred speech, and coma or other disorders of consciousness. Physical symptoms include headaches that do not go away or worsen, vomiting or nausea, convulsions or seizures, abnormal dilation of the eyes, inability to awaken from sleep, weakness in the extremities and loss of coordination. In cases of severe brain injuries, the likelihood of areas with permanent disability is great, including neurocognitive deficits, delusions (often, to be specific, monothematic delusions), speech or movement problems, and intellectual disability. There may also be personality changes. The most severe cases result in coma or even persistent vegetative state. Symptoms observed in children include changes in eating habits, persistent irritability or sadness, changes in attention, disrupted sleeping habits, or loss of interest in toys. Presentation varies according to the injury. Some patients with head trauma stabilize and other patients deteriorate. A patient may present with or without neurological deficit. Patients with concussion may have a history of seconds to minutes unconsciousness, then normal arousal. Disturbance of vision and equilibrium may also occur. Common symptoms of head injury include coma, confusion, drowsiness, personality change, seizures, nausea and vomiting, headache and a lucid interval, during which a patient appears conscious only to deteriorate later. leaking cerebrospinal fluid (a clear fluid drainage from nose, mouth or ear) is strongly indicative of basilar skull fracture and the tearing of sheaths surrounding the brain, which can lead to secondary brain infection. Basilar skull fractures, those that occur at the base of the skull, are associated with Battle's sign, a subcutaneous bleed over the mastoid, hemotympanum, and cerebrospinal fluid rhinorrhea and otorrhea. Because brain injuries can be life-threatening, even people with apparently slight injuries, with no noticeable signs or complaints, require close observation; They have a chance for severe symptoms later on. The caretakers of those patients with mild trauma who are released from the hospital are frequently advised to rouse the patient several times during the next 12 to 24 hours to assess for worsening symptoms. The Glasgow Coma Scale (GCS) is a tool for measuring degree of unconsciousness and is thus a useful tool for determining severity of injury. The Pediatric Glasgow Coma Scale is used in young children. The widely used PECARN Pediatric Head Injury/Trauma Algorithm helps physicians weigh risk-benefit of imaging in a clinical setting given multiple factors about the patient—including mechanism/location of injury, age of patient, and GCS score. Symptoms of brain injuries can also be influenced by the location of the injury and as a result impairments are specific to the part of the brain affected. Lesion size is correlated with severity, recovery, and comprehension. Brain injuries often create impairment or disability that can vary greatly in severity. Studies show there is a correlation between brain lesion and language, speech, and category-specific disorders. Wernicke's aphasia is associated with anomia, unknowingly making up words (neologisms), and problems with comprehension. The symptoms of Wernicke’s aphasia are caused by damage to the posterior section of the superior temporal gyrus. Damage to the Broca’s area typically produces symptoms like omitting functional words (agrammatism), sound production changes, dyslexia, dysgraphia, and problems with comprehension and production. Broca’s aphasia is indicative of damage to the posterior inferior frontal gyrus of the brain. An impairment following damage to a region of the brain does not necessarily imply that the damaged area is wholly responsible for the cognitive process which is impaired, however. For example, in pure alexia, the ability to read is destroyed by a lesion damaging both the left visual field and the connection between the right visual field and the language areas (Broca's area and Wernicke's area). However, this does not mean one suffering from pure alexia is incapable of comprehending speech—merely that there is no connection between their working visual cortex and language areas—as is demonstrated by the fact that pure alexics can still write, speak, and even transcribe letters without understanding their meaning. Lesions to the fusiform gyrus often result in prosopagnosia, the inability to distinguish faces and other complex objects from each other. Lesions in the amygdala would eliminate the enhanced activation seen in occipital and fusiform visual areas in response to fear with the area intact. Amygdala lesions change the functional pattern of activation to emotional stimuli in regions that are distant from the amygdala. Other lesions to the visual cortex have different effects depending on the location of the damage. Lesions to V1, for example, can cause blindsight in different areas of the brain depending on the size of the lesion and location relative to the calcarine fissure. Lesions to V4 can cause color-blindness, and bilateral lesions to MT/V5 can cause the loss of the ability to perceive motion. Lesions to the parietal lobes may result in agnosia, an inability to recognize complex objects, smells, or shapes, or amorphosynthesis, a loss of perception on the opposite side of the body. Head injuries can be caused by a large variety of reasons. All of these causes can be put into two categories used to classify head injuries; those that occur from impact (blows) and those that occur from shaking. Common causes of head injury due to impact are motor vehicle traffic collisions, home and occupational accidents, falls, assault, and sports related accidents. Head injuries from shaking are most common amongst infants and children. According to the United States CDC, 32% of traumatic brain injuries (another, more specific, term for head injuries) are caused by falls, 10% by assaults, 16.5% by being struck by or against something, 17% by motor vehicle accidents, and 21% by other/unknown ways. In addition, the highest rate of injury is among children ages 0–14 and adults age 65 and older. Brain injuries that include brain damage can also be brought on by exposure to toxic chemicals, lack of oxygen, tumors, infections, and stroke. Possible causes of widespread brain damage include birth hypoxia, prolonged hypoxia (shortage of oxygen), poisoning by teratogens (including alcohol), infection, and neurological illness. Brain tumors can increase intracranial pressure, causing brain damage. There are a few methods used to diagnose a head injury. A healthcare professional will ask the patient questions revolving around the injury as well as questions to help determine in what ways the injury is affecting function. In addition to this hearing, vision, balance, and reflexes may also be assessed as an indicator of the severity of the injury. A non-contrast CT of the head should be performed immediately in all those who have suffered a moderate or severe head injury. A CT is an imaging technique that allows physicians to see inside the head without surgery in order to determine if there is internal bleeding or swelling in the brain. Computed tomography (CT) has become the diagnostic modality of choice for head trauma due to its accuracy, reliability, safety, and wide availability. The changes in microcirculation, impaired auto-regulation, cerebral edema, and axonal injury start as soon as head injury occurs and manifest as clinical, biochemical, and radiological changes. An MRI may also be conducted to determine if someone has abnormal growths or tumors in the brain or to determine if the patient has had a stroke. Glasgow Coma Scale (GCS) is the most widely used scoring system used to assess the level of severity of a brain injury. This method is based on the objective observations of specific traits to determine the severity of a brain injury. It is based on three traits eye opening, verbal response, and motor response, gauged as described below. Based on the Glasgow Coma Scale severity is classified as follows, severe brain injuries score 3-8, moderate brain injuries score 9-12 and mild score 13-15. There are several imaging techniques that can aid in diagnosing and assessing the extent of brain damage, such as computed tomography (CT) scan, magnetic resonance imaging (MRI), diffusion tensor imaging (DTI) and magnetic resonance spectroscopy (MRS), positron emission tomography (PET), single-photon emission tomography (SPECT). CT scans and MRI are the two techniques widely used and are most effective. CT scans can show brain bleeds, fractures of the skull, fluid build up in the brain that will lead to increased cranial pressure. MRI is able to better to detect smaller injuries, detect damage within the brain, diffuse axonal injury, injuries to the brainstem, posterior fossa, and subtemporal and subfrontal regions. However patients with pacemakers, metallic implants, or other metal within their bodies are unable to have an MRI done. Typically the other imaging techniques are not used in a clinical setting because of the cost, lack of availability. Most head injuries are of a benign nature and require no treatment beyond analgesics such as acetaminophen. Non-steroidal painkillers such as ibuprofen are avoided since they could make any potential bleeding worse. Due to the high risk of even minor brain injuries, close monitoring for potential complications such as intracranial bleeding. If the brain has been severely damaged by trauma, neurosurgical evaluation may be useful. Treatments may involve controlling elevated intracranial pressure. This can include sedation, paralytics, cerebrospinal fluid diversion. Second line alternatives include decompressive craniectomy (Jagannathan et al. found a net 65% favorable outcomes rate in pediatric patients), barbiturate coma, hypertonic saline and hypothermia. Although all of these methods have potential benefits, there has been no randomized study that has shown unequivocal benefit. Clinicians will often consult clinical decision support rules such as the Canadian CT Head Rule or the New Orleans/Charity Head injury/Trauma Rule to decide if the patient needs further imaging studies or observation only. Rules like these are usually studied in depth by multiple research groups with large patient cohorts to ensure accuracy given the risk of adverse events in this area. Prognosis, or the likely progress of a disorder, depends on the nature, location, and cause of the brain damage (see Traumatic brain injury, Focal and diffuse brain injury, Primary and secondary brain injury). In children with uncomplicated minor head injuries the risk of intra cranial bleeding over the next year is rare at 2 cases per 1 million. In some cases transient neurological disturbances may occur, lasting minutes to hours. Malignant post traumatic cerebral swelling can develop unexpectedly in stable patients after an injury, as can post traumatic seizures. Recovery in children with neurologic deficits will vary. Children with neurologic deficits who improve daily are more likely to recover, while those who are vegetative for months are less likely to improve. Most patients without deficits have full recovery. However, persons who sustain head trauma resulting in unconsciousness for an hour or more have twice the risk of developing Alzheimer's disease later in life. Head injury may be associated with a neck injury. Bruises on the back or neck, neck pain, or pain radiating to the arms are signs of cervical spine injury and merit spinal immobilization via application of a cervical collar and possibly a long board.If the neurological exam is normal this is reassuring. Reassessment is needed if there is a worsening headache, seizure, one sided weakness, or has persistent vomiting. To combat overuse of Head CT Scans yielding negative intracranial hemorrhage, which unnecessarily expose patients to radiation and increase time in the hospital and cost of the visit, multiple clinical decision support rules have been developed to help clinicians weigh the option to scan a patient with a head injury. Among these are the Canadian Head CT rule, the PECARN Head Injury/Trauma Algorithm, and the New Orleans/Charity Head Injury/Trauma Rule all help clinicians make these decisions using easily obtained information and noninvasive practices. Brain injuries are very hard to predict in outcome. Many tests and specialists are needed to determine the likelihood of the prognosis. People with minor brain damage can have debilitating side effects; not just severe brain damage has debilitating effects. The side- effects of a brain injury depend on location and the body’s response to injury. Even a mild concussion can have long term effects that may not resolve. The foundation for understanding human behavior and brain injury can be attributed to the case of Phineas Gage and the famous case studies by Paul Broca. The first case study on Phineas Gage’s head injury is one of the most astonishing brain injuries in history. In 1848, Phineas Gage was paving way for a new railroad line when he encountered an accidental explosion of a tamping iron straight through his frontal lobe. Gage observed to be intellectually unaffected but exemplified post injury behavioral deficits. These deficits include: becoming sporadic, disrespectful, extremely profane, and gave no regard for other workers. Gage started having seizures in February, dying only four months later on May 21, 1860. Ten years later, Paul Broca examined two patients exhibiting impaired speech due to frontal lobe injuries. Broca’s first patient lacked productive speech. He saw this as an opportunity to address language localization. It wasn't until Leborgne, formally known as "tan", died when Broca confirmed the frontal lobe lesion from an autopsy. The second patient had similar speech impairments, supporting his findings on language localization. The results of both cases became a vital verification of the relationship between speech and the left cerebral hemisphere. The affected areas are known today as Broca’s area and Broca’s Aphasia. A few years later, a German neuroscientist, Carl Wernicke, consulted on a stroke patient. The patient experienced neither speech nor hearing impairments, but suffered from a few brain deficits. These deficits included: lacking the ability to comprehend what was spoken to him and the words written down. 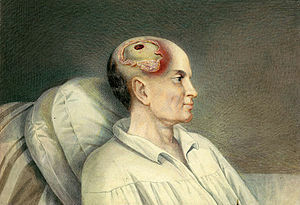 After his death, Wernicke examined his autopsy that found a lesion located in the left temporal region. This area became known as Wernicke's area. Wernicke later hypothesized the relationship between Wernicke's area and Broca's area, which was proven fact. Head injury is the leading cause of death in many countries. ^ a b Atianzar K, Casterella P, Zhang M, Sharma R, Gafoor S (2017). "Update on the Management of Patent Foramen Ovale in 2017: Indication for Closure and Literature Review". US Cardiology Review. 11 (2): 75. doi:10.15420/usc.2017:18:1. ISSN 1758-3896. ^ Elbaum J (2007-04-13). Counseling Individuals Post Acquired Brain Injury. Acquired Brain Injury. Springer New York. pp. 259–274. ISBN 9780387375748. ^ Proskuriakova NA, Kasendeeva MK (September 1975). "[Importance of Co35 in the treatment of secondary hypochromic anemia in young children]". Zdravookhranenie Kirgizii (5): 44–8. PMID 1942. ^ Daisley A, Kischka U, Tams R (2008). Head Injury. Oxford: OUP Oxford. ^ Macfarlane R, Hardy DG (1997). Outcome after Head, Neck and Spinal Trauma: a medicolegal guide. Oxford: Reed Educational and Professional Publishing Ltd. ISBN 978-0-7506-2178-6. ^ Powell T (2004). Head Injury: A Practical Guide (2nd ed.). United Kingdom: Speech mark publishing Ltd. ISBN 978-0-86388-451-1. ^ Arciniegas DB, Anderson CA, Topkoff J, McAllister TW (December 2005). "Mild traumatic brain injury: a neuropsychiatric approach to diagnosis, evaluation, and treatment". Neuropsychiatric Disease and Treatment. 1 (4): 311–27. PMC 2424119. PMID 18568112. ^ Seidenwurm DI (2007). "Introduction to brain imaging". In Brant WE, Helms CA (eds.). Fundamentals of Diagnostic Radiology. Philadelphia: Lippincott, Williams & Wilkins. p. 53. ISBN 978-0-7817-6135-2. Archived from the original on 2017-11-06. Retrieved 2008-11-17. ^ a b Meschia JF (February 2014). "Traumatic brain injury and stroke". Mayo Clinic Proceedings. 89 (2): 142–3. doi:10.1016/j.mayocp.2013.12.006. PMID 24485126. ^ Kuppermann N, Holmes JF, Dayan PS, Hoyle JD, Atabaki SM, Holubkov R, et al. (October 2009). "Identification of children at very low risk of clinically-important brain injuries after head trauma: a prospective cohort study". Lancet. 374 (9696): 1160–70. doi:10.1016/S0140-6736(09)61558-0. PMID 19758692. ^ "DNALC Internet Sites: Dolan DNA Learning Center". Choice Reviews Online. 47 (6): 47–3137–47–3137. 2010-02-01. doi:10.5860/choice.47-3137. ^ Kean ML (October 2003). "Syntactic deficits in aphasia: Was Wernicke right after all?". Brain and Language. 87 (1): 27–28. doi:10.1016/s0093-934x(03)00180-9. ^ Wilkes KV (October 1980). "More Brain Lesions". Philosophy. 55 (214): 455–470. doi:10.1017/s0031819100049482. ^ Celesia GG (January 2010). "Visual Perception and Awareness". Journal of Psychophysiology. 24 (2): 62–67. doi:10.1027/0269-8803/a000014. ^ Jaeger W, Krastel H, Braun S (December 1988). "[Cerebral achromatopsia (symptoms, course, differential diagnosis and strategy of the study). I]". Klinische Monatsblatter Fur Augenheilkunde (in German). 193 (6): 627–34. doi:10.1055/s-2008-1050309. PMID 3265459. ^ Alberts J, Cherian N (2014). Headaches, Traumatic Brain Injury, and Concussion. The Cleveland Clinic Manual of Headache Therapy. Springer International Publishing. pp. 341–352. doi:10.1007/978-3-319-04072-1_24. ISBN 9783319040714. ^ Åstrand R, Romner B (2012). Classification of Head Injury. Management of Severe Traumatic Brain Injury. Springer Berlin Heidelberg. pp. 11–16. doi:10.1007/978-3-642-28126-6_2. ISBN 9783642281259. ^ a b "Traumatic Brain Injury | Signs, Symptoms, & Diagnosis". www.alz.org. Retrieved 2018-06-22. ^ "TBI | Traumatic Brain Injury | Traumatic Brain Injury Resources | Brain Injury Support | Brain Injury Information". www.traumaticbraininjury.com. Retrieved 2018-06-22. ^ "NICE". NICE. Retrieved 2018-06-22. ^ Hariqbal S (2011). Cross-sectional imaging made easy. New Delhi: Jaypee Brothers Medical Pub. ISBN 9789350251959. OCLC 913381359. ^ Stiell IG, Clement CM, Rowe BH, Schull MJ, Brison R, Cass D, Eisenhauer MA, McKnight RD, Bandiera G, Holroyd B, Lee JS, Dreyer J, Worthington JR, Reardon M, Greenberg G, Lesiuk H, MacPhail I, Wells GA (September 2005). "Comparison of the Canadian CT Head Rule and the New Orleans Criteria in patients with minor head injury". JAMA. 294 (12): 1511–8. doi:10.1001/jama.294.12.1511. PMC 3997198. PMID 16189364. ^ Hamilton M, Mrazik M, Johnson DW (July 2010). "Incidence of delayed intracranial hemorrhage in children after uncomplicated minor head injuries". Pediatrics. 126 (1): e33–9. doi:10.1542/peds.2009-0692. PMID 20566618. ^ Small GW (June 2002). "What we need to know about age related memory loss". BMJ. 324 (7352): 1502–5. doi:10.1136/bmj.324.7352.1502. PMC 1123445. PMID 12077041. ^ Haas LF (December 2001). "Phineas Gage and the science of brain localisation". Journal of Neurology, Neurosurgery, and Psychiatry. 71 (6): 761. doi:10.1136/jnnp.71.6.761. PMC 1737620. PMID 11723197. ^ Dronkers NF, Plaisant O, Iba-Zizen MT, Cabanis EA (May 2007). "Paul Broca's historic cases: high resolution MR imaging of the brains of Leborgne and Lelong". Brain. 130 (Pt 5): 1432–41. doi:10.1093/brain/awm042. PMID 17405763. ^ Guenther K (November 2013). "The disappearing lesion: sigmund freud, sensory-motor physiology, and the beginnings of psychoanalysis*". Modern Intellectual History. 10 (3): 569–601. doi:10.1017/S147924431300022X. ^ Debas HT, Donkor P, Gawande A, Jamison DT, Kruk ME, Mock CN (2015). Debas HT, Donkor P, Gawande A, Jamison DT, Kruk ME, Mock CN (eds.). Essential Surgery. Disease Control Priorities. 1 (3rd ed.). Washington, DC: World Bank. doi:10.1596/978-1-4648-0346-8. ISBN 978-1-4648-0346-8. PMID 26740991. This page was last edited on 15 April 2019, at 14:03 (UTC).